Product information "Bosch HMT84M421B White Microwave 25L"
Make preparing and cooking food stress-free with the Bosch HMT84M421B Microwave Oven. A range of electronic control programmes take the guess work out of preparing your food. Featuring Bosch’s AutoPilot 7, you can choose from three auto-cook, and four defrost programmes, to perfectly cook a range of food types. Simply enter the weight and type of food you’re cooking, and the auto-cook programme will choose the optimal temperature and cooking time. The defrost settings will safely thaw out whatever food you need while maintaining hygiene levels. The HMT84M421B microwave oven includes a variety of easy-to-use controls, such as the retractable dial which allows you to precisely alter its settings. You can then clearly see the settings on the large digital display. A convenient memory function remembers your settings for next time, while a 99 minute timer alerts you when your food is finished. Keeping an eye on your food is simple too, with a strong interior light. Choose from five different power levels, going all the way up to an impressive 900 W – perfect for when you’re in a rush and need great tasting food quickly. The 25-litre capacity and 31.5 cm glass turntable of this Bosch microwave allow you to fit in an array of food types easily, while the modern white finish will look great in any home. Fitted with a side opening door which opens at the push of a button, the HMT84M421B gives you quick and easy access. The transparent front and internal light mean you can keep an eye on your food as it cooks. This model is also available with a 17-litre capacity and 800 W.
Preparing food is simple with the Bosch HMT84M421B Microwave’s range of programmes and great features. Order yours at Euronics today! 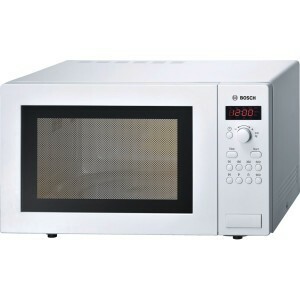 Related links to "Bosch HMT84M421B White Microwave 25L"
Customer review for "Bosch HMT84M421B White Microwave 25L"